Easily block non-work related applications, review detailed application usage log with complete analysis report about application usage, and receive real-time alerts on unauthorized access. Managers may concern about whether illegal software is being used within the company and illegal software is being used within the company. Improper use or management of application may not only affect staff’s productivity, the usage of resources, but also involve a violation of company regulation as well as the law. 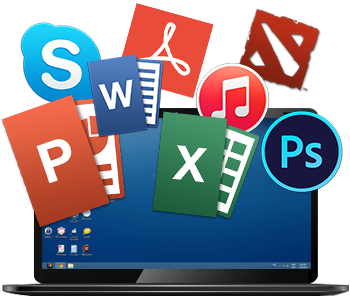 Are there any applications that you do not want people to use, for example, BT, download tools, chat tools, and game software during office hours? Would like to know if your employees are wasting time and lack of productivity? SurveilStar Application Monitoring feature aims to control and monitor application usage. It provides system administrators with detailed logs, application statistics and complete analysis reports which can assist them in understanding user behaviour. Moreover, it is useful for management purpose. For example, its statistics will serve as a reference for answering issues like what applications should be controlled in order to increase work efficiency. Administrator can block application usage by directly adding the name of the application, such as msn.exe. This policy is applied by string matching. If user changes the application name to msn123.exe, this policy will be invalid. To avoid this, administrator can set the second control policy. Administrator can categorize all prohibited applications and put them into an application class, and then select that application class to block. In this way, even if the user changes the application name, as long as the program itself does not change, this policy remains in effect. Warning: Block all applications will result in the disabled of most processes. In order to avoid potential losses, please set the policy cautiously.